Simon Lubega (left), manager of the Wambizzi Pig Cooperative Abattoir, in Uganda, in discussion with the EC’s Roberto Ridolfi (right) and other stakeholders during a tour of his biogas plant (photo credit: ILRI/Brian Kawuma). This article is written by Brian Kawuma, communications officer for ILRI in Uganda. Members of the Uganda country team of the International Livestock Research Institute (ILRI) hosted a five-person delegation from the European Commission (EC) and the International Fund for Agricultural Development (IFAD) on 28 and 29 Aug 2015. Led by Roberto Ridolfi, director for sustainable development at the EC, and accompanied by Balduin Zimmer, Margarita Astralaga, Amine Belhamissi and Malu Muia Ndavi, the delegation sought to understand the work done by ILRI and its partners to enhance Uganda’s pig value chain and how this work relates to climate change adaptation and mitigation work. As part of their visit, the guests toured Wambizzi Pig Cooperative Society slaughterhouse, the only centralized pig abattoir in the country, where ILRI and partners are piloting the setup of a bio-digester that will transform pig slaughter waste into clean energy (biogas) for heating and lighting. The innovation was lauded for the opportunities it presents for reducing tree cutting for firewood as well as reducing water pollution due to dumping untreated waste. ‘We need to scale up such innovations for a greener earth’, said the EC-IFAD delegation. ILRI staff and partners pose for photo with the IFAD-EC delegation at the ILRI office in Kampala (photo credit: ILRI/Brian Kawuma). The delegation later held a dialogue with seven pig farmers from Masaka in a meeting that was attended by ILRI staff and officials from the Masaka District local government. The farmers presented different interventions being piloted by ILRI that they have benefited from, including use of planted forages and local feed resources for pig diets, implementation of biosecurity strategies on farms to counter the spread of African swine fever, and collective action through producer groups/cooperatives for greater access to input and output markets. Additionally, representatives of the pig farmers’ cooperative highlighted an ongoing pilot of the pig business hub in the Kabonera sub-county of Masaka that is expected to improve farmer access to markets and business development services. 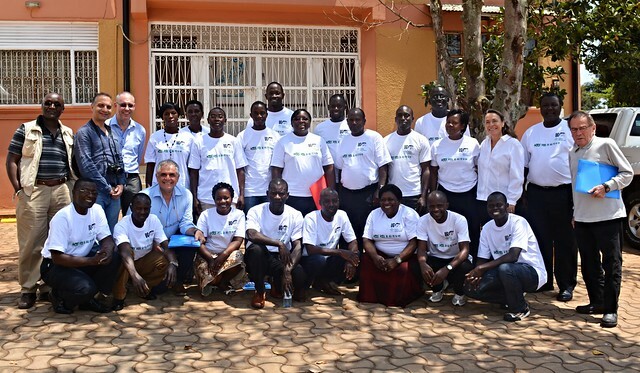 Commending ILRI for the good work it is doing, Roberto Ridolfi urged the organization to focus on the ‘last inch’—the critical links between research and development outcomes—by working closely with other CGIAR centres and development partners. ‘I thank IFAD for supporting the smallholder pig value chain project—it is a vital link between research and development’, Ridolfi said. While appreciating the role of research in agriculture, Ridolfi stressed the need for researchers to produce deliverables that clearly benefit poor people. He took particular note of ILRI’s work in catalyzing the formation and strengthening of pig farmer cooperatives in Uganda. These cooperatives, he said, should help eliminate unnecessary middlemen and give farmers greater bargaining power with pork buyers and consumers. 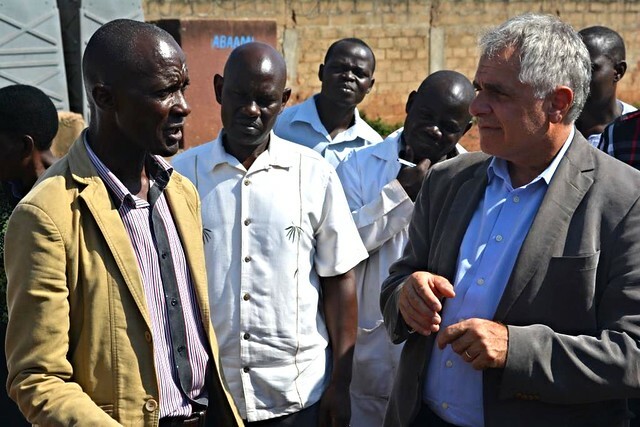 Raising the issue of water scarcity in the dry season, Ridolfi recommended that ILRI and its partners explore sustainable and scalable water harvesting technologies for smallholder farmers. The EC director commended the pig farmers from Masaka for being proactive in finding solutions to their farming challenges and embracing collective action. He encouraged them to use producer cooperatives to enable members to borrow money among themselves at good rates and also to borrow from banks to finance big investments. And he spoke of opportunities for the EC directly to support farmer groups. From 2011 to 2013, IFAD and the EC funded a Smallholder Pig Value Chain Project to improve the livelihoods, incomes and assets of smallholders, women in particular, in Kamuli, Mukono and Masaka districts of eastern and central Uganda. The project helped the pig farmers increase their productivity, reduce their risks and access markets. Watch a 2-minute video clip (between minutes 4 and 6) about ILRI’s work to enhance Uganda’s pig value chains; this film was showcased at the COP 21 climate change conference in Paris in Nov 2015. Tags: IFAD, Irish Aid, SPVCD. Bookmark the permalink.